I love doing the photography, but sometimes—often, in fact—the experience is more important. Such was true last night, when I hiked the Corona Arch Trail near Moab, Utah. 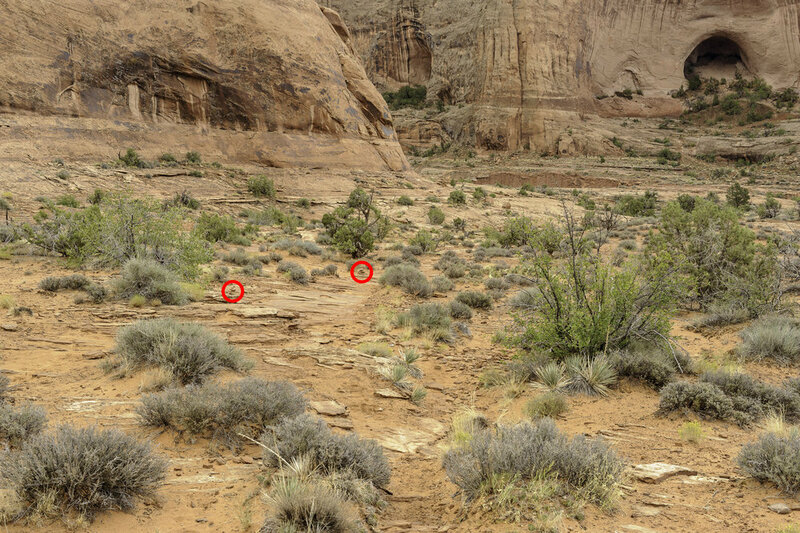 The trail runs 1.5 miles one-way through BLM land to a pair of arches, one rather old and one rather youngish (by geological standards). The trail crosses railroad tracks and weaves through wildlife fences, and in two parts you need to hold a cable lest you fall, and in one part you need to climb a ladder lest you need to turn back. Along the way you see cacti and slickrock and washes and cliffs and boulders and a valley of high-desert landscape so beautiful that you’ll certainly stop walking for a moment just so you can stand and gaze and wonder how we’re so lucky to live on a planet so pretty. I hiked this trail not because I had to. No assignment beckoned me, no promise obliged me. I wanted only to celebrate the 50th birthday of the National Trails System—which, you may know, is today. And what better way to celebrate, I figured, than to hike one of the newest national trails? Corona Arch Trail was named as such this past May. Union Pacific Railroad Potash Rail, along the Corona Arch Trail, Moab, Utah. Nikon D3s, 24-70mm f/2.8. 498 seconds, f/4, ISO 800. Milky Way and boulder, along the Corona Arch Trail, Moab, Utah. Nikon D3s, Irix 15mm f/2.4. 25 seconds, f/2.5, ISO 8000. I set out on the trail as the sun set on the horizon. I always talk about scouting a location before photographing it at night, and that goes quadruple when you’re also hiking it at night. Alas, I didn’t scout. I’d traveled to Moab only yesterday morning—to explore, to research, to photograph and to start getting ready to speak at the Out of Moab photography conference. I wasn’t here to hike a national trail, but the idea somehow got in the rental car with me, and it wouldn’t leave me alone for the 3.5-hour ride from the airport, so I relented and decided I’d walk into the unknown (albeit a short unknown) for my first night of shooting. On 4 hours of sleep. With jet lag. First, I found a campsite near the trailhead, along the banks of the Colorado River, and pitched my tent. That’s not the sort of task I wanted delaying my walk till dark, but it’s also not the sort of task I wanted waiting for me at midnight after a hike. I preferred the ability to march off the trail late, collapse into my sleeping bag and quickly drift to sleep to the sounds of the rippling river and the whisper of wind through the willows and cottonwoods hovering over my tent. The sun rolled down, and darkness rolled in—quickly. A new moon replaced that big ol’ sun, and some high clouds blocked some sky. And I was on a trail I didn’t know. It’s not the kind of trail that tunnels through a forest in an easy-to-see sort of way. Rather, it’s the kind that meanders over slabs of rock and over hills that don’t have much shrubbery to delineate where the side of a path ends and where the edge of wilderness begins. In other words, it’s the kind that can be hard to stay on without daylight. 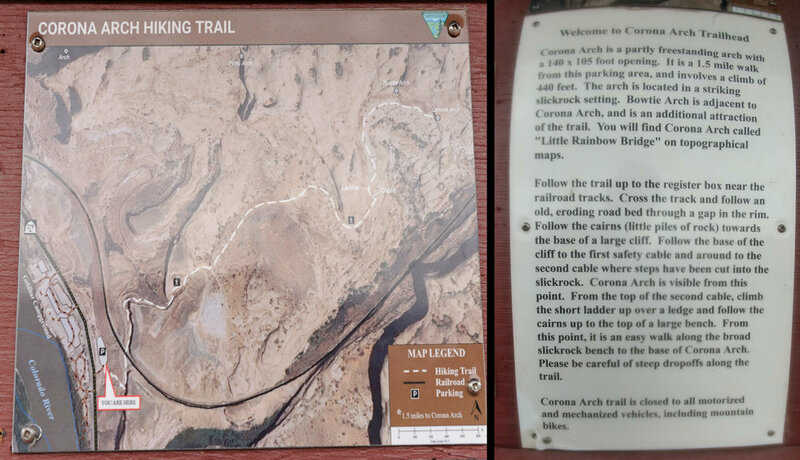 Before heading off on a trail I’m unfamiliar with (in the dark, no less), I took cell-phone pictures of the map and directions posted at the trailhead. It was useful info when I didn’t know where to turn. I’ve been on hikes before. In Olympic, in Acadia, in Big Bend, in Rocky Mountain, in Bryce Canyon, in Lassen Volcanic, in Death Valley. With experience comes intuition. You often know which way the trail goes, even if you don’t know the trail. Last night, I was thinking that exact thought when I realized I hadn’t seen a cairn in a while. I was off trail. And I didn’t know how to get back on. So much for my intuition. I backtracked, then tried another possible route. I backtracked again, then tried yet another. I stood on a rock ledge, now needing a flashlight to see anything at all, wondering if, halfway to my goal, I’d need to abandon my night’s mission. Then I saw it—a cairn in the valley! Succeeded by several more! Onward! Which way do I go? The trail through the valley and along the cliff isn’t too hard to follow in daytime, but proved a (fun) challenge with no moon. Can you spot the cairns in the photos below? How about in the dark? I found the bottom of the cliff (not hard—it’s pretty high, in both an awe-inspiring and daunting way). Then I found the cables to steady myself on a steepish incline. And the smooth half-shoe-size steps scalloped into the rock face. And the second set of cables. And the ladder. I was also, now and then, finding faint paint blazes marking the direction of the trail. Green blazes, on red rock. For a guy who’s red-green color blind. I appreciated the gesture. But after noticing the drop, I switched on my Coast headlamp—not to my usually preferred red mode, but to bright, white light, because I have a 5-year-old daughter who’s expecting me home alive next week. I love walking under starry skies, but there will be more of them in future years, and I want to walk under them with her. The cairns led the way—when I could spot them with my flashlight. What also served me well was my hiking shoes. I’ve been committed (not officially) to Salomon trail runners for many years. I trust their tread, and the tread treated me well on this trail—I didn’t slip once, which was critical for my confidence while hiking atop a cliff in the dark. I also trust their shoes’ wide base, which saved me from rolling an ankle several times on uneven rock. I never felt in danger, but I was persistently aware of the palpable fact that I would be in danger if I didn’t mind my environment and make all my choices prudently. So I hiked on, confidently, though constantly looking to my right to make sure the cliff wasn’t close. Then, I reached Corona Arch. I turned off my headlamp and let my eyes adjust to the dark. It’s a beautiful location. An impressive rock formation 140 feet wide, 105 feet across. It’s a window to receding rock face on one side, and to that magnificent valley on the other. From the arch, you look across the landscape toward a wide ridge with rough character, while behind you a cliff with a couple of aspiring arches (see you in 10,000 years!) towers over your shoulders. So I used my old simple Nikon trigger release with the camera on Bulb mode and counted my shutter speed in my head. During my final, 16-minute exposure, I lay back on the rock and watched the stars quietly pass behind the arch’s silhouette. I worked on only two compositions (remember: no sleep, yes jet lag), and then felt ready to hike back. Corona Arch, Moab, Utah—the better (I think) of my two setups from the location. Nikon D3s, Irix 15mm f/2.4 lens. 985 seconds, f/5.6, ISO 2500. I began the return trip, confidently, though constantly looking at that cliff to my left. My intuition was more reliable on the way out. I knew the trail now, knew the landmarks, knew the general direction. And even when I lost the trail, I found it. Even when you don’t know where a trail is, you can usually tell where it isn’t, which is a very good place to start. You re-find the trail by process of elimination. I did get a little lost yet again, after losing sight of cairns and of green blazes on red rock, but I ended up on a ridge from where I could see the campfires of the other few people who had pitched tents not far from mine. Comfortable that I was nearly back, I decided to photograph some more, then I returned to the car, then to the tent, more tired and more satisfied than when I’d begun. About 60,000 miles of national trails weave through our natural spaces. Some of these trails are famous: Appalachian, Pacific Crest, Continental Divide. Many are not: Ice Age, Ala Kahakai, Mormon Pioneer. They’re all worth walking a mile or more. And you don’t have to travel to Moab to do so. Every state in the U.S. has a national trail. Happy 50th, National Trail System. Oh wow, the places you go. For more information on the National Trails System, visit the NPS website. For more on the 50th Anniversary celebration of the national trails, see www.trails50.org. Newer PostOur First Night Photography Summit and More — We’re On the Road Again!